Follow Your Heart, it is Smarter Than You Think_ | | Oddly_EvenOddly_Even. The article states that the heart’s electromagnetic field is the strongest in the body. An EEG designed to read brain waves can read the heart’s frequency spectrum from three feet away, without electrodes! The Heart’s electromagnetic frequency arcs out from the Heart and back in the form of a torus field. The axis of this Heart torus extends from the pelvic floor to the top of the skull, and the whole field is holographic, meaning that information about it can be read from each and every point in the torus. I love learning about the heart’s energy field. The heart chakra is central among the seven chakras — three chakras above and three below. It includes the arms. The human energy field has often been described as oval or egg-shaped — is it really the heart’s energy field? And while some descriptions have that egg-shaped field extending below the feet, at least one that I know of (Castaneda) describes it as encompassing the body from the pelvis up, excluding the legs. The spine and spinal cord of Western anatomy/sushumna nadi in yoga/conception vessel and governing vessel in TCM extend from the pelvic floor to the top of the skull. I love it when the ancient traditions and science come together. 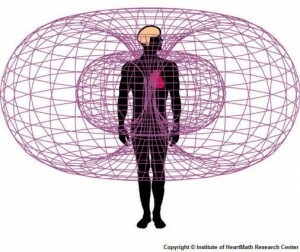 The Hearts’ torus electromagnetic field is not the only source that emits this type of electromagnetic field. Every atom emits the same torus field. The Earth is also at the center of a torus, so is the solar system and even our galaxy…and all are holographic. Scientists believe there is a good possibility that there is only one universal torus encompassing an infinite number of interacting, holographic tori within its spectrum. Because electromagnetic torus fields are holographic, it is more than likely that the sum total of our Universe is present within the frequency spectrum of a single torus. This means that each one of us is connected to the entire Universe and as such, can access all the information within it at any given moment. When we get quiet and access what we hold in our Hearts, we are literally connecting to the limitless supply and Wisdom of the Universe, thereby enabling what we perceive as “miracles” to enter into our lives. What does that do to your mental map of who you really are? This entry was posted in heart and tagged Castaneda, chakras, conception vessel, egg-shaped, energy field, governing vessel, heart, Joseph Chilton-Pearce, Oddly Even, oval, spine, sushumna nadi, torus by MaryAnn Reynolds. Bookmark the permalink. I like that you are wondering about the center of the torus, in the human aura, or field. In my work I have discovered that the heart is the receiver in the body of the Spirit wisdom and mission for this life. Yet it is not the center of Spirit in form. Peace!